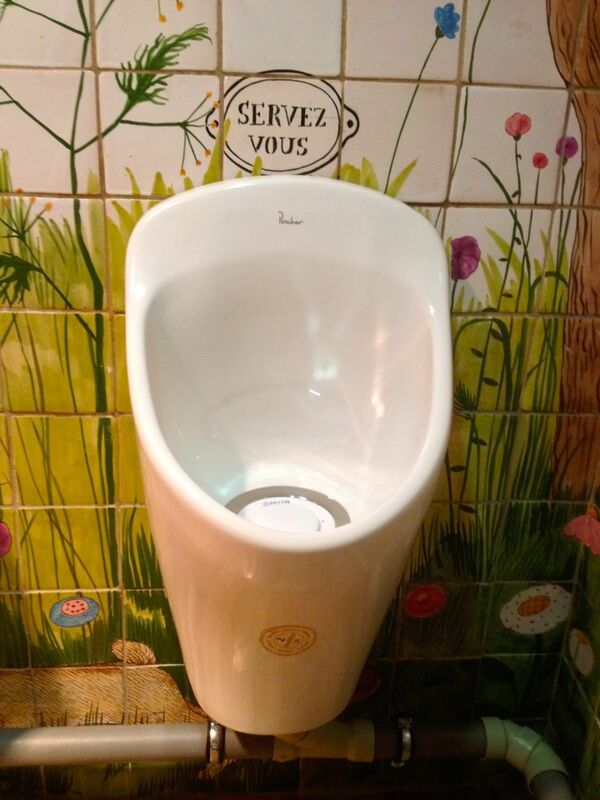 “Serve Yourself” says the caption over this urinal in Strasbourg, France. he image of the industrial economy as a great machine oiled by the sweat and blood of its workers has been a common trope for Marxist and anti-capitalist writers. Much has changed since the industrial revolution inspired such metaphors, but the costs of lubricating social processes remains a relevant issue in these post-industrial, accelerated, and uncertain times. Based on the last two decades of social and cultural studies, one could gather that the world we live in is becoming increasingly fluid (Bauman) and mobile (Urry). But what enables social and cultural “matter” to flow at increasing rates? This question is inspired by discussions that took place during the Touring Consumption conference at Karlshochschule this past weekend, a conference that focused on tourism through the lens of consumption (and vice-versa). During closing discussions at the conference, keynote speaker Steve Miles (Manchester Metropolitan U) raised doubts about the explanatory power of “mobility” as an analytic concept for the present, arguing that it makes assumptions about the ease and (lack of) consequences of intensified movement. To extend his critique, paradigms of mobility risk presuming a world of frictionless and easy flows, thus ignoring the ways that intensified movement can also entail friction, erosion, blockages, and collisions. In economics … market liquidity is the ability to convert shares into cash (and cash into shares) at little to no cost and at any given moment. Liquid assets, in turn, are assets that can be converted into something else quickly and with little or no loss of value (e.g., cash, shares, treasury bills, a bank account balance). In this sense, liquidarity is solidarity that aspires to liquidity; it strives to be a network of “low cost” transactions and lubricated exchanges. In light of Miles’s comments, then, the crucial word in this quote is “strives”: these social scenes strive to act like a network of “low cost,” easy-flowing exchanges, but this striving might have its own costs. A social situation can feel fluid and easy, but that feeling may conceal the hard edges of something far less pleasant. And we might ask ourselves what/who conceals these hard edges, and at what cost. In other words, we should also be thinking about the (at times unpleasant) work that goes into creating the conditions of possibility for lubricated sociability—as well as the negative consequences of sustaining these conditions. Friction: this term could be used to describe the moments when these dynamics of vague, fluid belonging actually end up excluding, harming, and otherwise maltreating people. Examples of these might be: discovering that you weren’t invited to an event involving a group to which you thought you belonged; policing supposedly “inclusive” spaces in ways that target particular identities (like excluding non-white men from queer spaces for the “protection” of queers); or being unable to keep up with the constant movement and change that seems to be compulsory in contemporary society. Lubricants: these could be the decisions to ignore potential or actual frictions, such as turning a blind eye to instances of discrimination or tolerating volatile and uncertain conditions in the interest of supporting a sense of fluid belonging. Lubricants could also be those social norms that pressure actors to ignore sources of friction, such as the collective avoidance of discussing of who belongs to (and how) to a particular social scene, or the tacit expectation to tolerate the “fricative” actions of others. Erosion: this could describe the long-term affective and corporeal consequences of dealing with friction. For example, tolerating small frictions over time can erode one’s sense of belonging or social stability; these “small frictions” might include micro-aggressions against people who belong to stigmatized groups, unwanted/invasive touch and other forms of harassment. This could also be a way of describing the consequences of affective labor (especially in the service industry), where some of the work involves absorbing social frictions and managing the spiky personalities of one’s customers. This process of erosion can be subjectively felt as either de-texturizing (i.e., removing one’s sense of identity and uniqueness) or carving deep furrows along fault-lines (i.e., making personal injuries deeper and broader). Blockages: these could be the conditions that prevent this fluid sociability from functioning as desired, including events / gestures / objects that destabilize this vague sense of belonging. But these could also be circumstances rather than things, such as not being able to pay entry to a socially-important event or not having the free time to participate in the leisure-worlds where much belonging is enacted. Collisions: a risk of accelerated mobility. Not only is the risk of collision higher as social structures are made more mobile and more fluid, but the severity of its potential consequences are directly related to velocity. Collisions might occur when an expected solidarity or intimacy fails to materialize (e.g., assuming your fellow revelers will help you when you get in trouble) or someone contests and resists the soft and fluid inequities of liquidarity (like challenging door policies at clubs or calling out elitism within social groups). Not only can these collisions be harmful to those involve, it can bring the whole “machine” to a grinding halt. That is, it can shatter the sense of expansive inclusion and easy sociability that everyone else was working hard to maintain. Sure, such collisions can vaporize self-congratulatory fantasies of easy collectivity, but they can also deprive underprivileged people from an aspirational, utopian scene that supported their sense of being in the world. Admittedly, I already addressed some of these concerns in my initial conceptualization of liquidarity in my dissertation, where I noted how “successful” liquidarity does not necessarily alleviate inequities and exclusions. In fact, one can criticize liquidarity as helping injustices to endure by neutralizing antagonisms rather than resolving the source of conflict. To return to fluid metaphors, lubrication doesn’t really transform the objects it lubricates, it just permits them grind against each other with less resistance and greater speed. But what I’m trying to do here is to shift the focus to the lubricant itself: what (or who) it is made of, how it is produced, and at what costs. In other words, what efforts and costs go into creating a sense of “effortless” flow and mobility? And so, maybe Miles’s critique of mobility can also serve as a somewhat depressing reassurance that the increasing mobility and fluidity of these past decades will not neutralize political antagonisms but rather create new ones—ones that are at least relevant to the changed/changing conditions of present-day life.